My wife and I will be in Tuscany for a few weeks in the spring and some friends will be coming by train into Florence from Milan to stay with us for a few days. I'll have a rental car, but I don't want to violate the ZTL in Florence and get a ticket in the mail. So, can I drive into Florence and pick them up at SMN without going thru the ZTL? The online maps look like the road in front of the station on the East side is out of the ZTL, but I can't be sure. And, I'd really like to park at the station if possible and put their luggage in the car while we explore the town for a few hours before heading out. Anyone know if this is doable? Or a good alternate? Thanks. Where are you staying? It sounds like elsewhere in Tuscany. As far as I remember, though, there's absolutely no free parking for miles around, and you do need some craftiness to navigate to the carparks without going through the ZTL. How to do this depends on where you're starting from. In theory the directions functionality on Google Maps (Italian postcodes are too big for planning routes, so you need to experiment with street addresses) should help you get to them without getting your numberplate photographed and your getting fined. You could park your car at the Florence airport and take the airport bus into the train station to meet your friends. Their luggage can be safely stowed in the left luggage room of the Florence train station so you can go sightseeing. After you return to pick up the luggage, you can all take the airport shuttle bus or a taxi back to the airport. Not the cheapest solution, but might be the one least likely to get you a ticket, and might also be the one that has everybody dragging luggage the least distances. I may be wrong but it sounds as if your current plan does not include visiting Florence on the day you pick them up. I ask where you're staying to determine if there may be a location to pick them up that's easier to negotiate than driving into the city. I say this in all good cheer, but for 2015, you really do need a new pair of glasses! The poster has already said he is staying in Tuscany -- to which you responded "Sounds like you are staying in Tuscany" (uh, yes), and also the poster very plainly said that the plan is to meet at the station and go sightseeing in Florence before going back to their Tuscan location. I like sandralist's suggestion and it may be a pretty cheap and convenient approach. I took that bus a few years ago as we arrived at the Florence airport. The cost wasn't more than 4E (at that time) per person and the trip took about 20 minutes. The bus stop was on the right (east) side of the station about 50-60 yards from the front. We also took the bus back to the airport and the bus terminal is across the street on the front left (southwest) corner of the train station. Sandralist, new glasses all around. I said ELSEWHERE in Tuscany. I'll give you the second point. I suppose that makes us even. Except for the unpleasantness factor. If you regard an explicit expression of good cheer as unpleasant, you need more than a new pair of glasses for 2015. Regarding New Year Cheer, it may depend on what liquid is in those new glasses. That is such a busy area. Tell them to get a taxi and meet you somewhere that you can safely park your car. Store the suitcases and then sightsee. I just remember the taxi rides from the train station and we were all not wanting to sit in the front anymore after the first ride. You could park out along the tram line, take it into Florence, have your friend store the luggage at the train station, tour around Florence, hop the tram back to your car. Sandralist/goldenautumn/zeppole/mushroom, in my world "good cheer" would be letting a mistake go unremarked. Yes, you can access the car park under the station from via Alamanni and exit it through via S. Caterina da Siena and via della Scala. Another option would be the car parks at Fortezza da Basso. There is a bypass to walk directly to platform #16 of the railway station. Occasionally, during trade fairs, these parking areas may be closed. Another simple choice is the underground park at Porta a Prato and a tram run (a single stop, three minutes) to the station. Good cheer with some snarkiness. That's interesting. Indeed, cathies. It makes the good cheer difficult to recognize as such. Sort of good cheer in critical clothing. Very confusing. Thanks everyone. 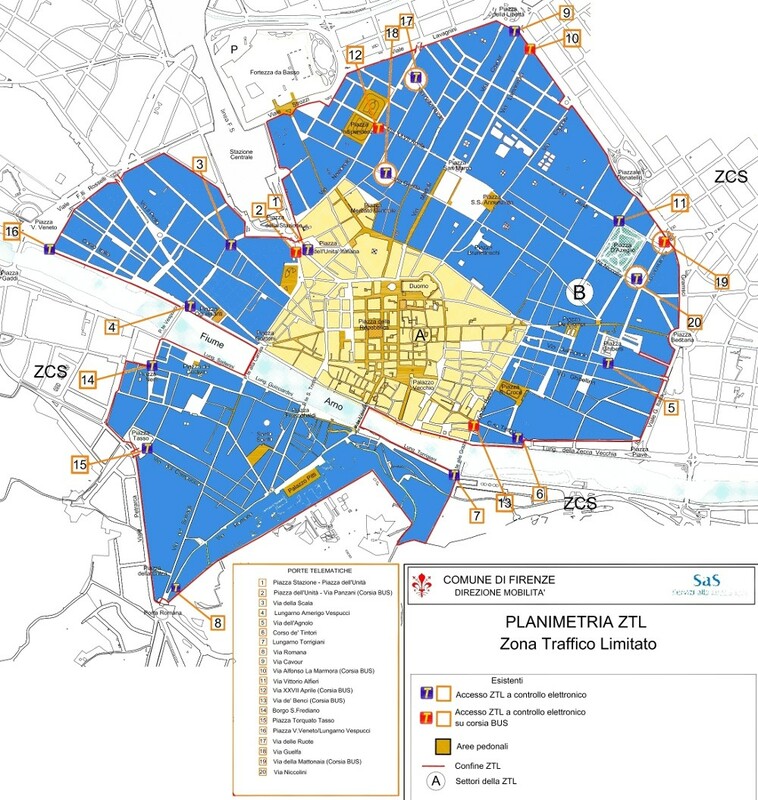 I'm staying outside of Radda and driving in for the day to meet them and do a little sightseeing, so I think asps' suggestions of either parking outside the area at Fortezza da Basso or Porta a Prato sounds the best.